Be the first to share your favorite memory, photo or story of Judge Leonard. This memorial page is dedicated for family, friends and future generations to celebrate the life of their loved one. 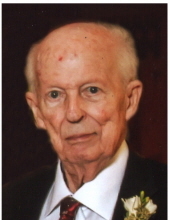 The Honorable Leonard D. Lybbert, 90, of Waterloo, a retired Judge of the First Judicial District of Iowa passed away on February 10, 2019. Judge Lybbert was born April 26, 1928, in Cresco, son of Edward and Genevieve Bacon Lybbert. He graduated from Cresco High School in 1945. Judge Lybbert and Jean Mick were married June 26, 1951 in Pocahontas, Iowa. They both graduated from the University of Iowa with B.A. degrees and Judge Lybbert followed up with a Juris Doctor Degree in 1951. He started private practice with Elwood, Lyons and Elwood in Cresco. After one year Judge Lybbert served for five years as a staff officer with the Air Force Judge Advocate Staff. The first half of his service involved serving in trial and defense capacity before general courts martial at Clark Air Base, the Phillipines. The second half of his service was a judge advocate and law officer of general courts martial at several bases but much of the time at Whiteman Air Base, Sedalia, Missouri, a Strategic Air Command jet center. After leaving the Air Force Judge Lybbert and his wife settled in Waterloo, Iowa and were proud parents of two sons, John and Chris, both of whom have passed away. Judge Lybbert joined the law firm of Kildee, Keith and Gallagher in 1956 and became a partner in 1960. The firm later became Gallagher, Lybbert, Martin & Burk. Over the next several years Judge Lybbert was admitted to the U.S. Supreme Court (1956), acquired a commercial pilots’ license (1965), served as an assistant city attorney and regular city attorney (1966-1974), was an officer and member of the Waterloo Sertoma Club, and supporter and participant (1989) in National Cancer Survivors Day activities. He was widely respected and received (great sense of humor) as a judge. Three complicated and high-profile cases bear his mark. Judge Lybbert denied a Motion for New Trial for Jerry Mark, convicted of killing his brother and his brother’s family in 1975.The Lawrence Hartman case involving the murder of Hartman’s spouse was one of the first televised trials in Black Hawk County and was a subject in a September 1982 edition of the New Yorker as well as in a book entitled “Ten Famous Trials". Judge Lybbert also presided over a bench trial of Lori Jean Malloy whom he found guilty of first-degree murder of her four-year old. Judge Lybbert’s ruling advised social services of the need to make “periodic visual observations” by other adults when an abused child is returned home. In retirement he enjoyed golfing, hunting, telling stories and serving as a Senior Judge. Survivors include: his wife, Jean; a brother, Gene Lybbert of Cedar Falls; many nieces and nephews, special friends, Jeff and Debbie Foulk of Waterloo and families, Scott (Laura) Foulk of Burnsville, Minnesota and Sara (D.J.) Loerzel and Hank Loerzel of Littleton, Colorado. Preceded in death by: two sons, John and Christopher Lybbert; three brothers, Elton, Edward and Donald Lybbert; and three sisters, Marian Wright, Josephine Tyrell and Helen Seargent. A memorial service will be 11 a.m. Thursday, Feb. 14, at First United Methodist Church. Private family inurnment will precede the service, where full military rites will be conducted by Evansdale Amvets Post 31, Waterloo Amvets Post 19 and the U. S. Air Force Honor Guard. Visitation will be from 4 to 6 p.m. Wednesday, Feb. 13, at Hagarty-Waychoff-Grarup Funeral Service on West Ridgeway. Memorials may be directed to Waterloo First United Methodist Church or Cedar Valley Hospice. Condolences may be left with www.hagartywaychoffgrarup.com. To send flowers or a remembrance gift to the family of Judge Leonard Lybbert, please visit our Tribute Store. West 4th St. and Ridgeway Ave.
"Email Address" would like to share the life celebration of Judge Leonard Lybbert. Click on the "link" to go to share a favorite memory or leave a condolence message for the family.